Mercedes-Benz 350SDL Serpentine/Drive Belt Replacement at your home or office. Mercedes-Benz 350SDL Serpentine/Drive Belt Replacement costs $118 on average. What is a serpentine belt and how does it work? A serpentine belt is a relatively long, flat, multi-ribbed belt that is driven by the engine’s crankshaft pulley. The belt drives many, and often all, of the engine accessories such as the alternator, air conditioning compressor, power steering pump, water pump, and air pump. The serpentine belt is tensioned by a hydraulic or spring-loaded automatic tensioner. Some older cars use a serpentine belt to drive most accessories but will also have a shorter v-style belt to drive, for example, the power steering pump. Regularly scheduled maintenance. Typically, belt manufacturers recommend belt replacement at 90,000 miles. However, the belt must be inspected for wear or damage at regular intervals prior to this high mileage. Squealing noise, belt slippage, visible belt damage. Should the belt fail or wear out prematurely, you may hear noise or you may see visible signs of deterioration such as missing chunks of rubber, excessive cracking, or a shredded appearance on the edge of the belt. Battery Light. A loose belt, perhaps caused by a defective tensioner, may not drive the alternator at adequate speed and thus the battery may discharge, causing the warning light to illuminate. Engine overheating. Often, the serpentine belt drives the water pump. In those applications, if the belt breaks the engine will overheat in seconds to minutes. If the belt is inadequately tensioned, you may notice higher-than-normal engine operating temperature. 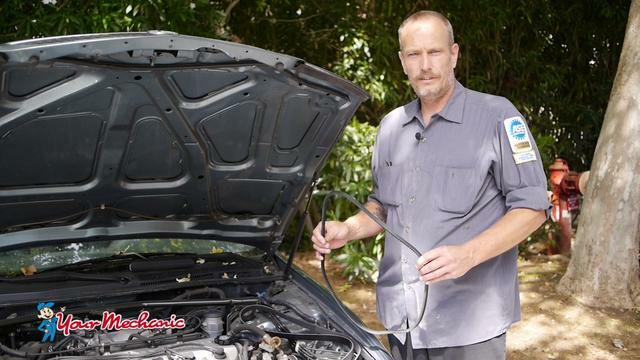 How do mechanics replace the serpentine belt? Prior to removing the belt, the mechanic must run the engine to determine if the idler pulley and the belt tensioner are noise-free. Those rotating components have grease filled bearings and are subject to wear. In addition, the mechanic will ensure that all pulleys and accessories are turning in the same plane. These steps help make sure your new belt will operate trouble-free for its full-service life. The belt’s routing path through the various components is noted. The belt tensioner is released, usually with a wrench or lever, to release the tension from the belt. With the tension off, the belt slides off the pulleys. All rotating components — that is the alternator, air conditioner compressor, etc. — are checked for smooth operation and no noise. If everything checks out, the new belt is slipped over all of the pulleys while holding the tensioner away from the belt. Once the belt is centered on all pulleys, the tensioner is released and the installation is complete. The engine is run to ensure normal operation. Is it safe to drive with a serpentine belt problem? No. Should the belt have visible damage, you risk unexpected and sudden breakage that could potentially leave you stranded. Serpentine belt problems that result in the alternator not charging may cause the battery to discharge, which will result in loss of electrical power to the vehicle. Additionally, if a deteriorated belt breaks and that belt drives the water pump, the engine will overheat in a matter of seconds. On many cars, the expected service life of a serpentine belt is around 90,000 miles. Should the belt fail well prior to that, a very careful inspection should be performed to check for out-of-alignment pulleys, a possibly out-of-position crankshaft harmonic balancer on which the drive pulley is mounted, binding pulleys, or a defective belt tensioner. Attention should always be given to serpentine belt routing, since proper routing is critical to proper belt tension, and function of the driven components. Sometimes it is difficult to distinguish serpentine belt related noise from other engine noises. In these cases, a mechanic will determine the origin of the noise by momentarily running the engine without the serpentine belt attached.